Parallel damper with electric actuator. A damper (otherwise known as a louvre) is a multi-element flow control device generally used to throttle large flows of air at low pressure. Dampers find common application in furnace and boiler draft control, and in HVAC (Heating, Ventilation, and Air Conditioning) systems. Common damper designs include parallel and radial. Parallel-vane dampers resemble a Venetian blind, with multiple rectangular vanes synchronously rotated to throttle flow through a rectangular opening. 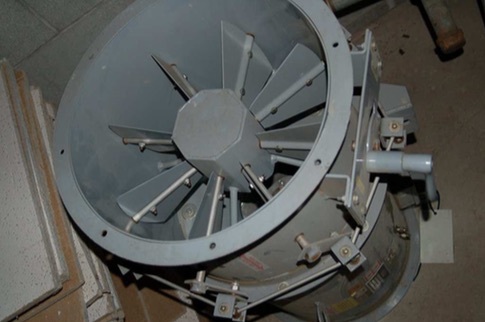 A photograph of a parallel-vane damper is shown above, part of an induced-draft (suction) air fan system on a separator at a cement plant. 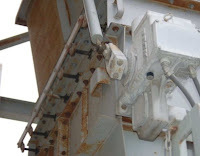 The vanes are not visible in this photograph because they reside inside the metal air duct, but the electric actuator mechanism and linkages connecting seven vane shafts together are visible. Pneumatic vane actuator damper drive. 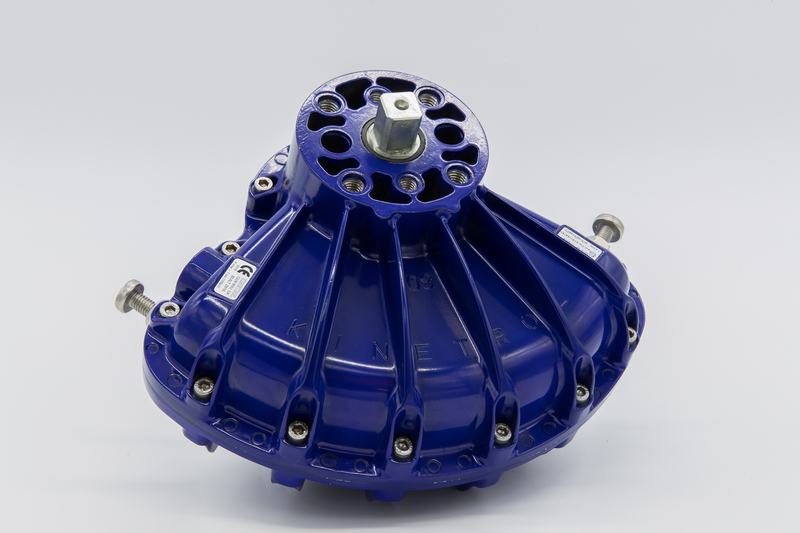 Radial-vane dampers use multiple vanes arranged like petals of a flower to throttle flow through a circular opening. A photograph of a radial-vane damper is shown here (note the levers and linkages on the periphery of the tube, synchronizing the motions of the eight vanes so they rotate at the same angle). 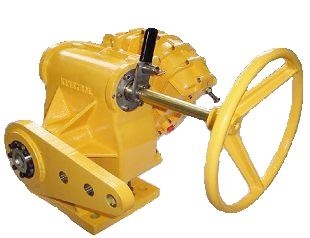 Dampers are opened and closed by electric or pneumatic drives. In recent years, the pneumatic vane actuator has earned an reputation for modulating dampers. 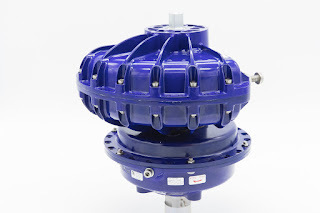 Used in critical applications commonly found in power plants, refineries, boilers, and furnaces, these unique damper drives provide precise combustion gas management, are proven to increase boiler efficiency, lower fuel consumption, reduce emissions, and reduce maintenance cost. Parts of this post are reprinted from Lessons In Industrial Instrumentation by Tony R. Kuphaldt – under the terms and conditions of the Creative Commons Attribution 4.0 International Public License. The Blueline Series actuators and spring return units with food grade coating have been added to the KinetrolUSA.com website. More information can be found here - http://www.kinetrolusa.com/blueline.